Jakarta Governor, Anies Baswedan receives Indonesian Trade Union Confederation (KSPI) visit. In this meeting, they talked about improving labor welfare in the Capital.
" Our target is to make our programs to help more Jakartans to get their rights"
In this meeting, Jakarta Manpower and Transmigration Dept. Head, Andri Yansyah; National Wages Council Deputy Head, Iswan Abdullah; SPSI LEM Head, Arif Winardi; related SKPDs heads and deputy heads; and representatives from 38 labor federations and unions also attended in this meeting. He stated, collaboration needs to be formed between Jakarta Provincial Government and various labor unions and federations to realize labor welfare. "Recently we just met for silaturahmi. 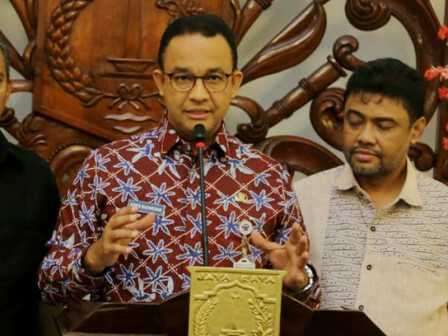 There are a various city government plans related to our efforts in improving community welfare, as well as opportunity and equality for anyone in Jakarta," he said in City Hall, Thursday (10/25). He explained, government programs should be ensured to reach all communities who have the right in data collection aspects, registration, and certainty that all get the same opportunity. "Our target is to make our programs to help more Jakartans to get their rights," he conveyed. Meanwhile, KSPI President, Said Iqbal appreciates Jakarta Government who have committed to collaborate with residents and stakeholders in creating the policies. Especially about labor welfare improvement in Jakarta. He assessed, Jakarta Government programs, both its regulation and implementation, that relate to labor welfare improvement could be on target and provide the right benefits. "We really appreciate programs and policies which are oriented to lower and middle class people including laborers," he mentioned. He appreciates programs such as Kartu Pekerja (Worker Card) that helps laborers to get subsidy for transportation cost and food cost. More importantly, they are benefited in Samawa Rp 0 Down Payment program. "Those programs are what we are waiting for," he expressed.